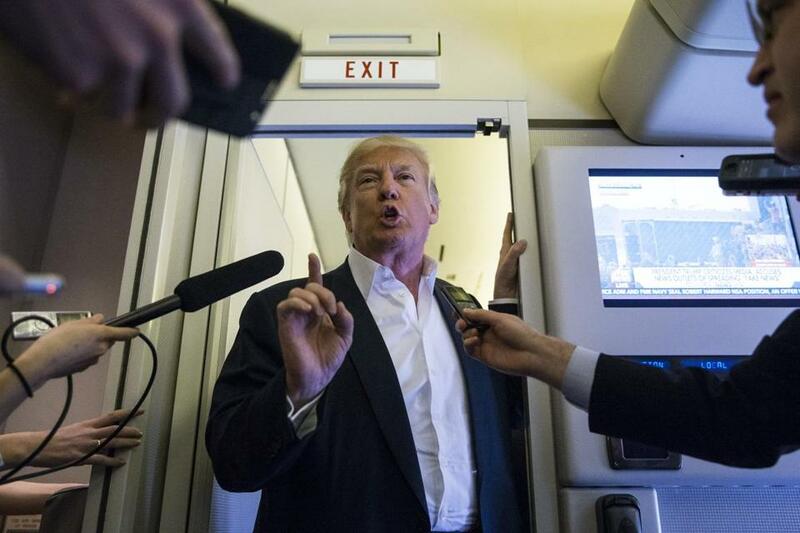 President Trump spoke to reporters aboard Air Force One on Feb. 18. 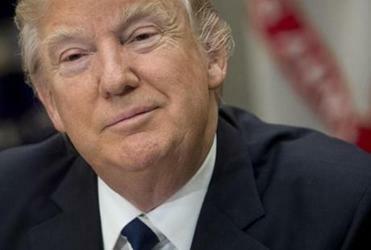 WASHINGTON — President Trump triggered deep concern when he discussed the merits of seizing Iraqi oil during a speech at the CIA just after taking office. But a few weeks later, on Presidents’ Day, Secretary of Defense Jim Mattis was in Baghdad assuring the Iraqis that the United States doesn’t take oil — it pays for it. The exact same day, on a different continent, Vice President Mike Pence was massaging another one of Trump’s ideas, trying to calm Europeans meeting in Brussels by saying the United States is committed to the NATO alliance. It was just one head-snapping day in the massive mop-up operation that Trump administration officials at many levels find themselves toiling to accomplish. The goal is to soothe world leaders who are trying to unlock the puzzle of when to take Trump at his word and when to believe the often more conciliatory statements of his surrogates. It’s a question that voters grappled with during last year’s campaign: Does one take him seriously or literally? Or both? And since his inauguration, the world is in the same unsettling position. Which Trump will show up for speech to Congress? The president who favors disruption over decorum could take Tuesday night in any number of directions. The consequences, he said, are predictable. “When foreign governments don’t believe there is certainty, they tend to look elsewhere for leadership,” Wade said. Some measure of disconnect is expected when a new administration takes power. But those who’ve served in the highest levels of the foreign policy establishment say they’ve never before seen so much inconsistency between what the president says and what his subordinates say he means. “This is highly unusual,” said Jake Sullivan, who was a national security adviser to Joe Biden when he was vice president, and deputy chief of staff to Hillary Clinton when she was secretary of state. He said that there were “occasional” discrepancies in public policy pronouncements during the Obama administration. “They would be swiftly resolved and clarified. They were the exception, not the rule. In this administration, they appear to be the rule, not the exception,” Sullivan said. Secretary of State Rex Tillerson (above) speaks to Trump “daily” on “every major foreign policy issue,” "said State Department spokesmaqn Mark Toner. The problem with the inconsistent approach is that both allies and foes are left uncertain about the Trump administration’s intentions, which can be terrifying to those who depend on the United States for security, while offering room for adversaries to possibly take advantage of the confusion to press their own agendas. One of the more shocking examples came this month, when Trump stood with Israeli leader Benjamin Netanyahu in the White House and seemed to back away from the “two-state solution,” the longtime tenet of US policy on the Israeli-Palestinian conflict that the road to peace includes separate sovereign states for each warring group. Trump said he could go either way on the question and would defer to the two parties. Within 24 hours, Trump’s ambassador to the United Nations, Nikki Haley, was in New York articulating the more traditional US policy in language that diplomats are used to hearing. 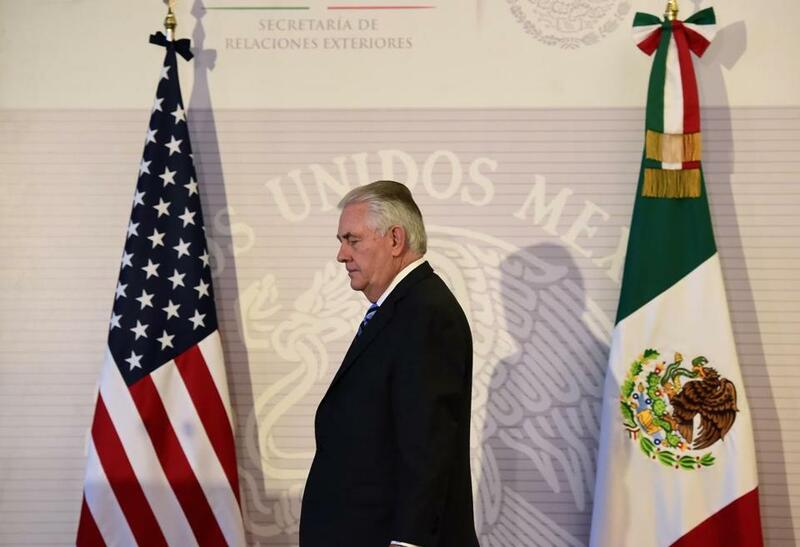 The secretary of state and the secretary of homeland security were both dispatched to Mexico last week to jointly meet with Mexican leaders, after President Enrique Peña Nieto canceled a trip to the United States because he was so offended by Trump’s frequent comments about Mexico footing the tab for a border wall. Other normally friendly foreign leaders are expressing all manner of surprise about Trump’s comments. Jean-Claude Juncker, European Commission president, accused Trump of trying to sow “division and disharmony in our communities” with his nationalistic comments and his disparagement of the European Union. Former Swedish prime minister Carl Bildt made fun of Trump after he referenced a terror attack there that didn’t happen. “What has he been smoking?” Bildt asked on Twitter. A tip for leaders who are confused about whether to trust the president or his emissaries is to watch how Trump reacts when Cabinet secretaries appear to contradict what he’s said. “They are not being rebuked by the White House for doing what they’re doing,” said Peter Feaver, a former member of the National Security Council staff under President George W. Bush. “That is a very important fact. If what they were doing was in fact contradicting the president’s decisions, Spicer would be thrown out there to walk the story back,” he said, referring to White House press secretary Sean Spicer. Still, foreign powers are left to work out this question: “How do you know which presidential comments are policy and which are just musing? That’s tough,” said Feaver, who is now a political science professor at Duke University. Making matters more difficult, there are broad areas of foreign policy that Trump didn’t address at all during the campaign. His views on many matters are simply unknown. The Tillerson State Department has not had the daily press briefings that foreign countries are accustomed to monitoring for insights, but announced Friday it will start holding them in March, though not necessarily on a daily basis. 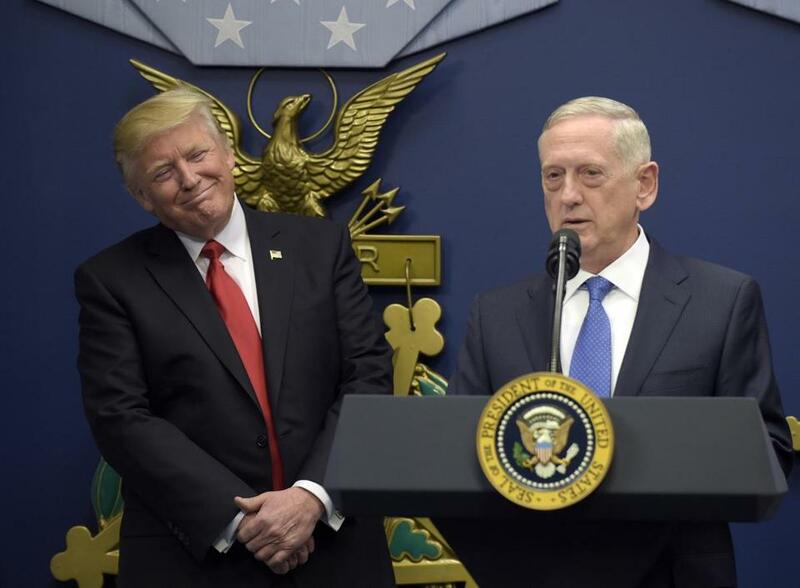 Trump listened as Defense Secretary Jim Mattis spoke last month at the Pentagon. Part of the reason for this muddle is that Trump has been slow to staff the mid-level of his foreign policy staff, according to several who watch the administration closely. Trump just hired a new national security adviser after firing his first choice last week. “This is why God invented national security advisers,” Wade said. Wade said the vast bureaucracy that’s often maligned by Trump is responsible for the inter-agency coordination of policy that ensures all arms of the government are working off the same script. “Deputy secretaries of state, deputy national security advisers, and assistant secretaries, they typically spend an enormous chunk of their time in windowless rooms making sure everyone is on the same page,” Wade said. Even Trump’s supporters acknowledge that the president’s way of talking about foreign policy can be difficult to track, but they say the world might have to just get used to it. “Some of it is his pronouncements are not always precise,” said Representative Ron DeSantis, a Florida Republican. “As a candidate that’s not always a great thing, but as a president it can . . . ” he said, trailing off. “You have gaps,” he added. Charles Krauthammer, writing in The Washington Post, pointed out that Trump’s foreign policy bureaucracy is almost designed to yield conflict: Its key players are part of the foreign policy establishment that Trump eschews. The idea plays into a common Washington theory that Trump is trying to replicate the “madman” approach to foreign policy employed by President Nixon. The idea is that foreign governments view the US president as unpredictable and therefore more quickly acquiesce to his demands. Krauthammer, despite being a frequent Trump critic, cited a few areas where that approach has worked out reasonably well for Trump in the past few weeks, including the decision by China to cease coal imports from North Korea, a step are aimed to punish the rogue nation by hurting its economy. There are signs that some of the normal rules of diplomacy do apply to Trump, and that he understands he can’t always play the disrupter. The key example is Israel, where Trump has promised repeatedly to relocate the US Embassy from Tel Aviv. “We will move the American embassy to the eternal capital of the Jewish people, Jerusalem,” Trump said to the American Israel Public Affairs Committee last March. It’s a promise that plays well to many American Jews, and one that many candidates including Obama have made. Once in office, however, presidents tend to renege, worried about seeming to take a one-sided view of the conflict and perhaps causing another Palestinian uprising. 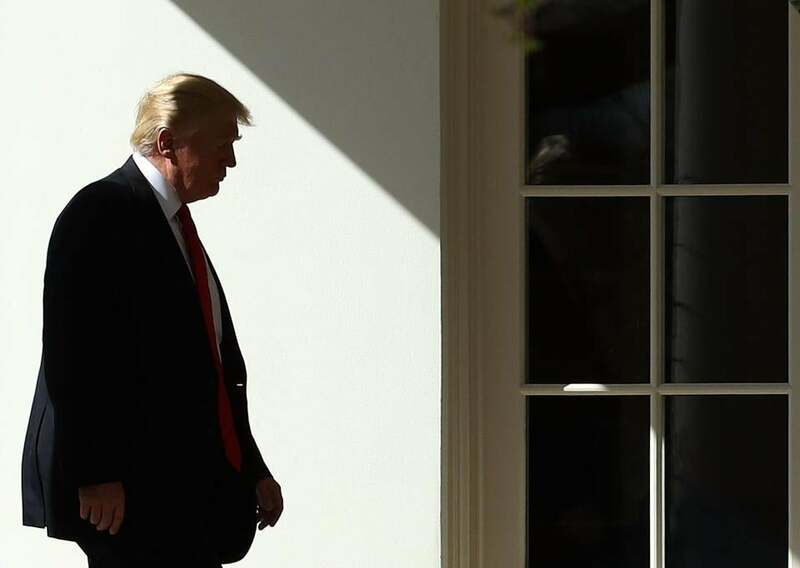 Trump walked to the Oval Office on Friday after returning to the White House.